GRAHAM – Oxfordshire Ironstone Co., Wroxton Oxfordshire, then Stanton & Staveley Ilkeston, Derbyshire. GRAHAM was delivered ex-works in May 1965 as one of a series of 325 horse power, 38-ton locos ordered by the Oxfordshire Ironstone Company to replace their steam locomotive fleet. GRAHAM took the name and BTC registration plates from the 0-6-0 Hunslet 50550 Class loco No. 2415 built in 1941 and was fitted with vacuum braking and a higher ratio gearbox for mainline working. Unfortunately a major downturn in demand for home ores meant that the outlying Oxfordshire ore fields with higher transport costs were the first large systems to close and by 1967 the whole OIC fleet were rendered redundant when the quarries closed. Unlike much of the fleet, GRAHAM did not find further work in the ore fields but instead was transferred to the Stanton & Staveley works at Ilkeston via a rebuild at Thomas Hill in Sheffield and repaint into standard Sentinel green livery. Remarkably the GRAHAM nameplates and the OIC registration plates were retained. At Stanton, GRAHAM received additional cast brass nameplates entitled STANTON No.61 on the cab sides signifying its number in the operational fleet. 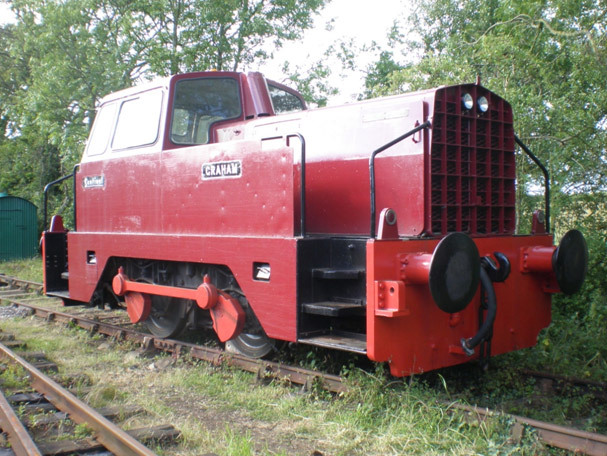 When the works was closed in 2007, GRAHAM was acquired by a member of the Museum as a loco not only suitable for passenger vehicle hauling but having a clear link to the ironstone industry. It arrived at Cottesmore on 9th March 2007 in an extremely run down condition..
GRAHAM was restored to working order within a year of arrival but has recently been subject to a thorough restoration including rewiring, bodywork repairs and completion of restoration of the original vacuum braking system to allow the loco to take charge of passenger trains for the first time in its history.